The Selbyville Middle School track team poses for a photo. 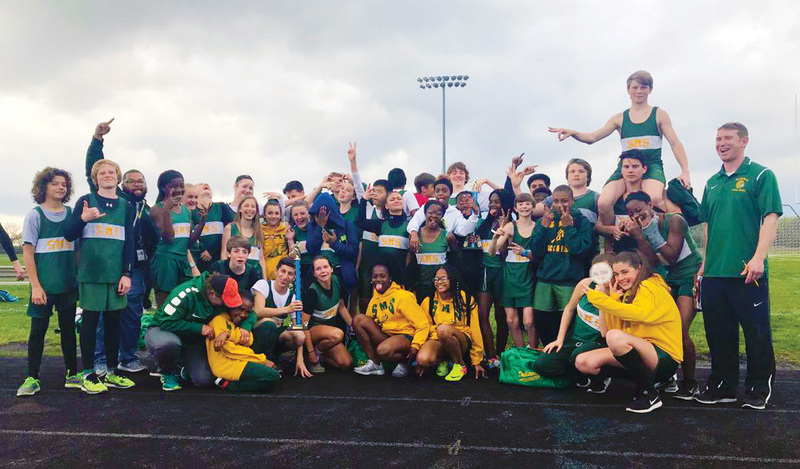 The school’s boys’ and girls’ track teams each recently won their district track meets against Georgetown and Millsboro. The boys won with a score of 82, while the girls earned 84.5 points. “I want to begin by saying how much of a pleasure it was to coach this group of athletes,” head coach Brian Benner said. “Our athletes´ accomplishments on the track this year were nothing short of impressive. At some point during the season, almost all of our athletes achieved their personal best results. Bennet White won the 1,600m, and finished second in the 800m, while Chris Sichina won the 800m. Evan Peterson and Jeremiah Dennis finish second and third, respectively, in the 55m hurdles. Alonti Oliver was third in the 100m and 200m. Selbyville’s Matt Engel, Johnathon Johnson, Raymond Andrade and Derek Check-Guzman teamed up to finish second in the 4-by-100 and 4-by-200 events. Check-Guzman also took second in the 400m. Dalton Hall took first in the long jump. SMS swept the triple jump, with Hayden Hall taking first, followed by Engel, then Caleb Galbreath. Hayden Hall also won the high jump, while Dalton Hall and T.J. Burke finished 1-2 in the shot put. Hall and Burke were joined by Tyler Corcoran to sweep the discus event for SMS. On the girls’ side, Alexis Pszcola was second in the 55m hurdles, while Parvas Goodman-Baker was third. Aniyah Blake took first in the 100m and 200m. In the 800m and 1,600m, Devin Hundley and Isabella Scharp finished first and second, respectively. The team of Pszcola, Tonia Perkins, Gabby Mills and Saige Dismuke took first in the 4-by-100. Pszcola, Mills, Dismuke, and Blake teamed up to win the 4-by-200 event. Paige Psaroudakis finished second in the 400m. In the long jump, Saniya Lewis, Laniya Lewis and Hundley swept for SMS. Both Lewises were joined by Mya McDonald to go 1-2-3 in the triple jump. Laniya Lewis won the high jump, while Morgan Freund topped out in the discus. Freund was second in the shot put, and was followed by Scarlet Dunn for third. “Another advantage we had was the ability to work with athletes from other SMS spring sport teams,” Benner concluded. “On occasion, athletes from girls’ soccer, softball and baseball would train and compete with our track team.